US President Donald Trump on Tuesday fired his FBI director James Comey, the man who leads the agency charged with investigating his campaign’s ties with Russia — a move that sent shockwaves through Washington. The surprise dismissal of Comey, who played a controversial role in last year’s presidential election, came as he was leading a probe into whether Trump’s aides colluded with Moscow to sway the November vote. Top Senate Democrat Chuck Schumer said he told Trump he was making a “big mistake” by dismissing Comey, a move that prompted parallels with a decision by a crisis-plagued Richard Nixon to fire his attorney general. Trump “has accepted the recommendation of the attorney general and the deputy attorney general regarding the dismissal of the director of the Federal Bureau of Investigation,” his spokesman Sean Spicer told reporters. A search for a new FBI director was to begin “immediately,” the White House said. “It is essential that we find new leadership for the FBI that restores public trust and confidence in its vital law enforcement mission,” Trump said. 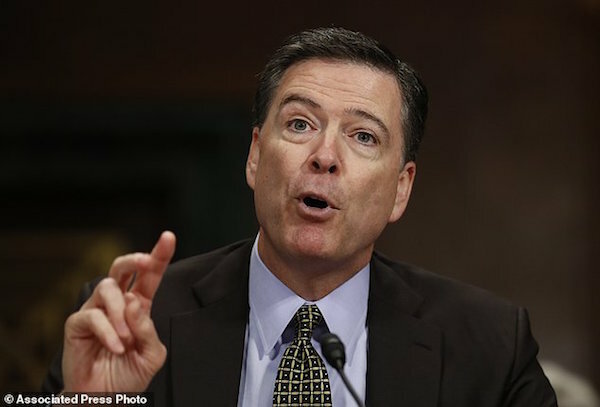 The stated reason for Comey’s dismissal — according to a memo from Deputy Attorney General Rod Rosenstein that was circulated by the White House — was for mishandling the probe into Democratic presidential hopeful Hillary Clinton’s emails. But his sacking raised immediate questions about Trump’s motives. He played an outsized — and controversial — role on the American political stage over the past year, lobbing one bombshell after another that rankled both parties in Washington. Clinton accused Comey of trashing her chances of becoming president by revealing an renewed investigation into her email use. He has confirmed that the agency is investigating Russian interference in last year’s presidential election and notably Moscow’s possible collusion with Trump’s campaign. When Trump initially decided to keep Comey — who was appointed by Barack Obama — in his job, it raised eyebrows from critics who saw it as a tacit reward for his role in damaging Clinton’s chances. During testimony to Congress last month, Comey flatly rejected Trump’s explosive claim that he was wiretapped by his predecessor. But it had become increasingly clear that Comey had set his sights on the issue of Russia’s election meddling, which has stalked Trump’s presidency since he took office. Adeola pls do independent analysis of issues and talking points of CNN, MSNBC OR FOX NEWS. That way you'll stand out. This is a friendly advise. You alluding Comey's sack to 'Nothing less than Nixonian' shows you did not do your homework but simply re-echoing Liberal media's talking points. I expect a lot better from you.